Recipe Categories Seafood | What Goes with What? 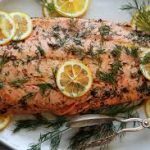 The salmon is so good and even better after a day or two and makes great leftovers and a nice lunch salad with a bit of mayo and mustard. I suggest a Costco trip to get a good large skinless piece, you won’t be sorry…. Toss sweet crabmeat with fresh mint and lime juice, then spoon it over mashed avocado on toast.